Ghostland is a dynamic and riveting tale set in post‐apocalyptic earth. From the first page I was swept away with the story. The heroine’s strength is subtle, but undeniable. The hero, everything you’d want a hero to be…and then some! Unforeseen twists in the plot kept me guessing until the very last page. Books like Ghostland are hard for me to read. Why? Because Jory Strong’s talent quickly ensnared me in the world she created, because I stayed up until the early morning hours reading under the covers, because I had an uncontrollable urge to flip to the last ten pages so I could see how the story ended; and when it finally did end, I was saddened because it was over. 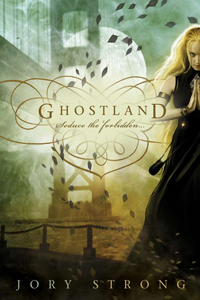 So, if you enjoy losing yourself in an exceptionally well‐written story with vivid world‐building and outstanding characters, Ghostland will live up to all your expectations. Click on image to visit Jory.